Bread is one of the things I’ve learned I shouldn’t eat as regularly as I’d like (as in, every meal, and for snacks in between). I used to eat bread at almost every meal. Carbs are our friends. You know, like those friends that you want to be good, but they are just, not the best for you? Those kind. Those delicious kind of friends. Avocado toast is especially something I love that I have steered away from at times. Bread is certainly not allowed on the Whole 30 I am currently completing, so I have the perfect little alternative to share with my fellow avocado toast lovers. There are so many variations you can make of this with different toppings, too. Even when you’re not completing a Whole 30, this sweet potato toast is sure to become one of your favorites! To make you will need: sweet potatoes and oil of your choice (avocado, olive, coconut). You will also need toppings– avocado is a must in my mind, but you can also add bell peppers, red chili flakes, smoked salmon, eggs, sausage, bacon, tomatoes, arugula or whatever else your heart fancies. Start by preheating the oven to 400 degrees and line a baking sheet with parchment paper. Then, wash your sweet potato and slice lengthwise, into even slices. A mandoline slicer will come in handy, or just use a sharp knife. Lightly oil both sides of the slice and place on parchment paper. Bake for 30 minutes, flipping half way through, or until slightly toasted. While the potato slices are baking, prepare your toppings. When the toast is ready, top with desired toppings and serve. Voila! You can end your avocado toast craving with these easy little replacements. You can use a similar process by cutting the sweet potato into rounds and using them for buns for hamburgers or for other sandwiches. 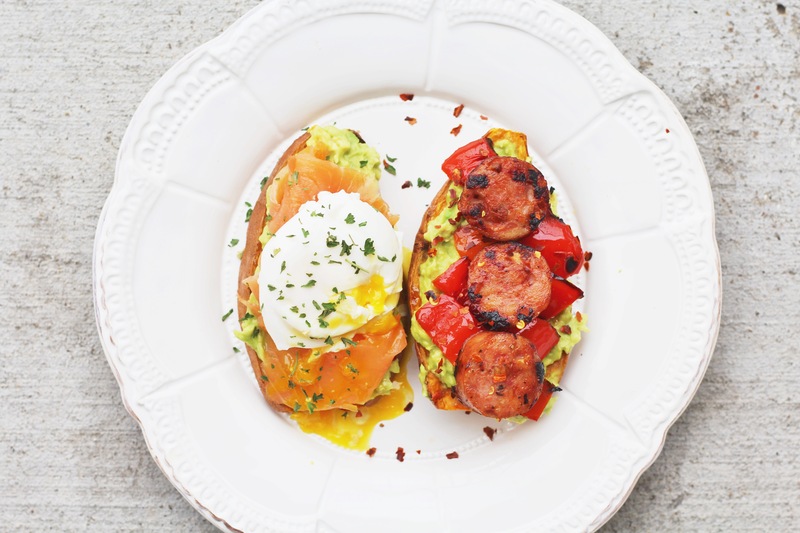 My favorites right now are below– 1) avocado, smoked salmon, a poached egg, and parsley and 2) avocado, grilled red bell peppers, Aidells chicken & apple sausage, and red pepper flakes. I love the combo of both together. 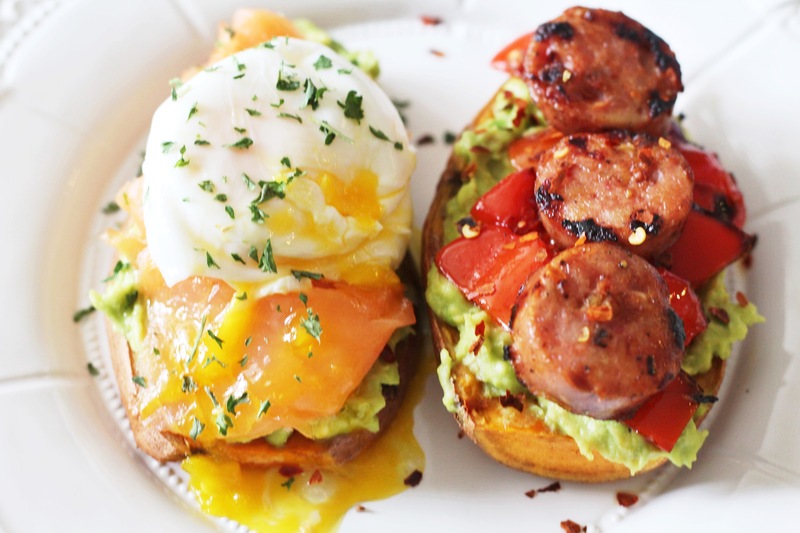 Avocado, Smoked Salmon, Eggs, Bell Peppers, Sausage, Bacon, etc. 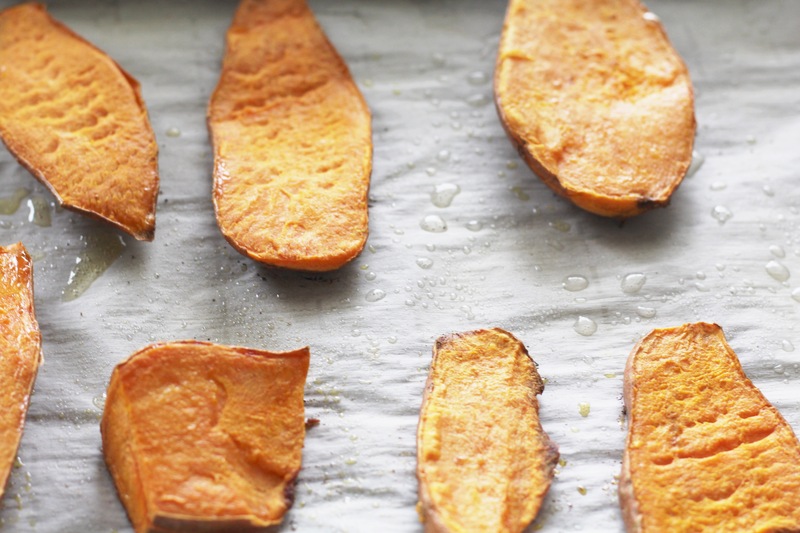 Slice Sweet potatoes lengthwise into even slices. Lightly oil both sides of the sweet potato and lay onto baking sheet. Bake for 30 minutes, flipping 1/2 way through. Add toppings of choice, serve, and enjoy!